In this paper we introduce a membrane system named adaptive P system which is able to adjust dynamically its behaviour depending on resource availability. Such a system is defined as a tree of membranes in which the objects are organized in multisets, and the rules are applied in a maximal parallel manner. We use guards on the right side of the rules in order to model the biological sensitivity to context, and in this way we are able to describe an adaptive behaviour. The Turing completeness of the adaptive P systems can be obtained only by using non-cooperative rules (with guards) working in the accepting case. 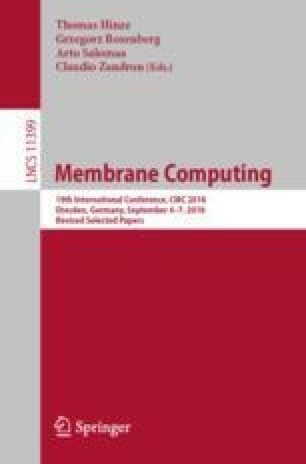 Using the adaptive P systems, we provide a polynomially uniform solution for an NP-complete problem (Subset Sum) by using specific membrane computing techniques. The solution employs a linear number of resources and evolution steps.